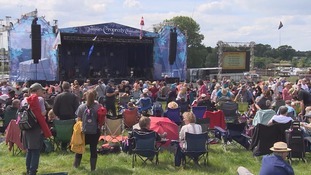 It's not the biggest of the summer music festivals, but Cropredy has a core of loyal supporters who've been eagerly awaiting the three-day event in Oxfordshire. It's staged by the music legends, Fairport Convention, and this year the band will be celebrating their golden anniversary. Penny spoke to Festival Director Gareth Williams, Pub Landlady Jill Ward, Village Shop Worker Chris Bradshaw, Ann Voce from Fair Mobility, festival fan Tim Hayes and Dave Pegg from Fairport Convention. Spring must be in the air because today saw the launch of the Brighton Festival 2017 and its famous fringe. Fifty one years old now, in the past famous names like Laurence Olivier and violinist, Yehudi Menuhin have taken part but it's just as famous for its children's parade and open approach that makes everyone welcome. This report by Tom Savvides includes and interview with the Chief Executive, Andrew Comben. The organisers of Southampton's Common People Festival have confirmed it will return to the city next year. Held on the Common it will be back for two days on May 28th and 29th. It's organised by former Radio 1 DJ Rob Da Bank and this year's event saw acts such as Fatboy Slim, Grace Jones and De La Soul perform. The first headline act of next June's Isle of Wight Festival has been announced. Queen with Adam Lambert will take to the stage at Seaclose Park on the Sunday night. It's the biggest celebration of digital culture and technology in the country, and it's happening throughout September. The Brighton Digital Festival is underway, with 200 events in 100 venues. It brings together musicians, engineers and artists. In fact, just about anyway who uses digital technology in their work. Malcolm Shaw spoke to Hugh Jones of Senseries, Simon Riley of Maker Club, Jesse Black Mooney of Brighton Digital Festival, and Mark Vidler and Graham Daniels of Addictive TV. The 4th Basingstoke Festival came to a grand finale on Sunday. The line-up has been revealed for a popular annual music festival based in Kent. Russell Kane, Nerina Pallott and the Noisettes complete the line-up at this year's Hop Farm Music Festival. This follows the earlier announcement that Grace Jones will headline the event on the 4th-6th July. Hop Farm Music Festival’s Neil Butkeraitis commented: “This is our first year in charge of the Hop Farm Music Festival, and, having started with a clean slate, we couldn’t be happier with our inaugural line-up. "We’ve got three bona-fide legends headlining and fantastic music both familiar and new all weekend, plus killer comedy and brilliant activities right across the farm. So, I think it’s safe to say, for all round entertainment, this year’s festival is breaking new ground for Hop Farm”. It's been confirmed that the Arctic Monkeys will headline this year's Reading Festival. The band will perform at the event which is held just off Richfield Avenue over the August bank holiday weekend.